Oil on board, 8" x 8 3/4"
A typical summertime sight along the backroads here. Standing this way, they can sweep the nuisance flies away from each other with their tails. 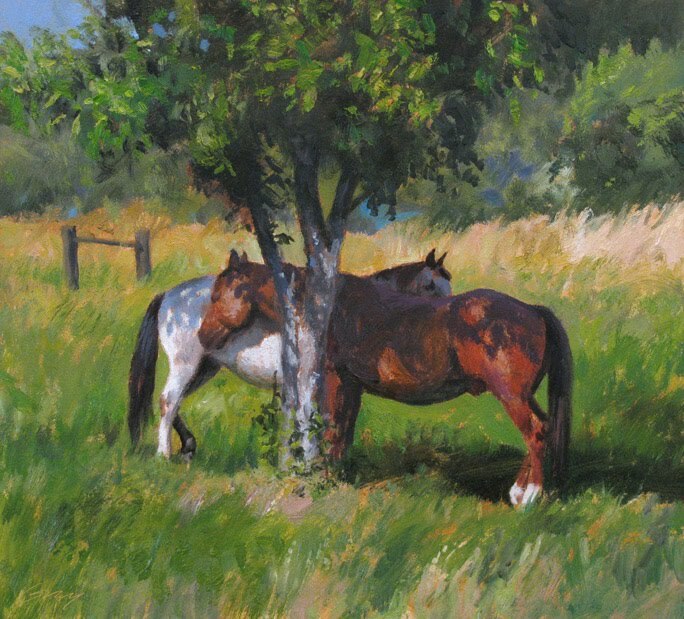 Don, You know I love horses and you did a great job with this painting. The scene is truly typical for horses on a summer day and makes such a lovely painting. How could I not love this one? Thanks a lot, Ruth--I really appreciate your comments. Your recent paintings are beautiful. Hi Tanner--thanks! Great to hear from you. Heinz--yes, you're right, it could be anywhere. Thanks for your comment and welcome to my blog. I can feel the wind and the heat. Great work. If you're going to be in the studio on Sat. the 21st we'll try to stop by later in the day. ahhh...(sigh) those horses (yes, i am horse crazy)and the composition... wonderful! Thanks, Bri. I'll probably be around on the 21st, but may not be in the studio. Give me a call before you get here, OK? Hi Rahina--very nice to hear from you, and thanks for the encouragement! Love this painting, Don. We see a lot of sleepy afternoons this time of year in Texas. I am imagining the warm, gentle summer breeze rustling by these two as they stand in the shade getting cool. What a beautiful scene, Don! Great work! Thanks, Marilyn. In that Texas summer heat a siesta is a great idea, right? Thanks so much, Erin--welcome to my blog! I keep coming back to this one! Love it, Don. Hi Takeyce, nice to hear from you--thanks.